Hello friends! Look at me, blogging two days in a row. It's like some sort of routine again. ;) Let's hope I can keep it up! Here's yet another card I made on WCMD. 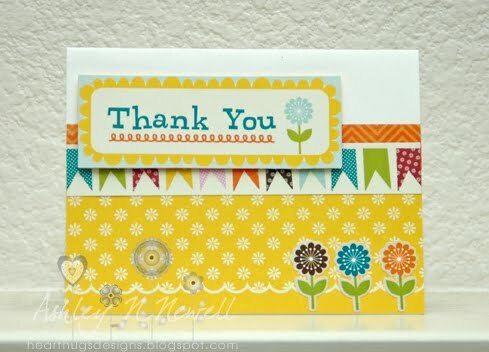 I think I blogged this one over at the Paper Maniac blog already but not here so I thought I'd share. Again, my love of Echo Park Paper is pretty apparent. I love being able to use one kit and make a card by just adding some card stock and adhesive. It makes me happy! I should really just keep some crafting kits, card stock, and a glue runner in the kitchen for when the kids are doing crafts or nicely playing. Because that happens a lot, insert eye roll here. Alright, have a great day everyone and hopefully, I'll remember to blog tomorrow too! wow.. love this card. I love the bright colours of the papers and chipboard. beautiful !! Love this card. That bright yellow rocks.